Sheila Kay Adams is the key figure in carrying forward to this day the tradition of unaccompanied ballad singing that has enriched her community for more than two centuries, promoting its beauty throughout our country and beyond, and insuring that it will be perpetuated by younger generations of singers well into the 21st century. 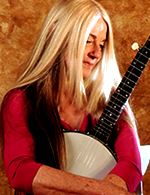 A former Public school teacher, Adams currently lives in western North Carolina and now pursues a career of sharing the music, stories, and heritage of her mountain culture. In this video, Adams sings her rendition of “Lady Isabel and the Elf Knight,” but beforehand she tells a short story about her mother and emphasizes the importance of holding onto cultural heritage. The National Heritage Awards were established in 1982 by Bess Lomax Hawes, then director of the Folk Arts Program at the NEA. It is a lifetime achievement honor modeled after Japan’s “National Living Treasures” and seeks to highlight folk artists and their continued contributions to the nation’s diverse cultural background. The NEA selects approximately ten to fifteen fellows annually and on their website provides biographies of all current and previous honorees. Come Go Home with Me is a collection of stories from Sheila Kay Adams that provides a rare portrait of a distinctive mountain community and charts the development of an artist’s unique voice. The tales range from stories of heroic, sometimes fierce, mountain settlers to the comic adventures of local drifters and tricksters, from magical childhood encounters to adult rites of passage. We meet Bertha and the snake handlers, local preacher Manassey Fender (who “looked like a pencil with a burr haircut, in a suit”), and Adams’s beloved grandfather Breaddaddy, who taught her about life and death with an enchanting graveyard dance. But perhaps the most powerful character depicted here is “Granny,” whom Adams calls “the most exciting person I have ever known and the best teacher I would ever have.” By weaving these remembrances into her stories, Adams both preserves and extends a rich artistic heritage. When photographer Rob Amberg first met Dellie Norton and her adopted son, Junior, in 1975, Norton was seventy-six years old and had lived most of her life in the small mountain community of Sodom Laurel, North Carolina, surrounded by close kin, tobacco fields, and the rugged wilderness of the southern Appalachians. Sodom Laurel Album traces the growing relationship between Norton and Amberg across the next two decades, years marked by the seasons of raising and harvesting food and tobacco and by the gatherings of family and friends for conversation, storytelling, and music. Richly evocative images are interlaced with stories of the people of Sodom Laurel and with Amberg’s own candid journals, which reveal his gradually growing understanding of this world he entered as a stranger. The book also includes a CD featuring Dellie Norton, Doug Wallin, and other singers of traditional Appalachian music. Through words, photographs, oral histories, and songs, Sodom Laurel Album tells the moving story of a once-isolated community on the brink of change, the people who live there, and the music that binds them together.